I am still sifting through the evidence on what makes an online retailer go from zero to 1.2 Billion sales in less than 10 years. I felt I needed to go beyond the tactics and to look the core values that have produced such a world class business and how that can be applied to any business or brand. Also we have a look at how social media has helped Zappos deliver and drive those values internally and externally. I have also included a couple of examples of my direct experiences with Zappos and how I personally witnessed the “WOW” factor. These are the ten core values that they live by from which they have developed their culture, brand, and their business strategies. Differentiate yourself, which means doing something a little unconventional and innovative. Must do something that’s “above and beyond” what’s expected. You must have an “emotional impact” on the receiver. Learn not only to not fear change, but to embrace it enthusiastically and encourage and drive it. Never accept or be too comfortable with the status quo because, historically, the companies that get into trouble are the ones that aren’t able to respond quickly enough and adapt to change. One of the things that makes Zappos different from a lot of other companies is that they value being fun and being a little weird. Many things they do might be a little unconventional — or else it wouldn’t be a little weird. They want the company to have a unique and memorable personality. Our company culture is what makes us successful, and in our culture, we celebrate and embrace our diversity and each person’s individuality. They want the weirdness in each employee to be expressed in each persons interactions with each other and in our work. Note: One of the side effects of encouraging weirdness is that it encourages people to think outside the box and be more innovative. Employees are more engaged in the work that they do, and the company as a whole becomes more innovative. Zappos use of social media helps spread and encourage this culture. A static web with no feedback and no interaction wouldn’t allow this culture to spread. Theybelieve if people aren’t making mistakes, then that means they’re not taking enough risks. Everyone to develop his/her gut about business decisions. To never become complacent and accept the status quo just because that’s the way things have always been done. Having the freedom to be creative in their solutions, makes your own luck. Note: Sometimes a sense of adventure and creativity causes you to be unconventional in their solutions, that’s what allows a company to rise above and stay ahead of the competition. Social media allows that to spread with minimal friction within and without the company through all types of media such as online video and Twitter. The goal is to help employees unlock that potential within each employee. A company only grows because it takes on new challenges, and it faces even more new challenges because they’re growing. If it ever gets too easy, then start looking for a tidal wave of competition to wash you away. It may seem sometimes like we don’t know what we’re doing. And it’s true but nobody else knows how to do what we’re doing either. They value strong relationships in all areas: with managers, direct reports, customers (internal and external), vendors, business partners, team members, and co-workers. Strong, positive relationships that are open and honest are a big part of what differentiates Zappos from most other companies. Develop emotional connections, at the end of the day it’s not what you say or what you do, but how you make people feel that matters the most. Note: Social media is all about open communication. Communication is always one of the weakest spots in any organization, social media enables this “digitally” in ways that never have been possible before. Below is a recent comment from a Zappos employee on a blog post I wrote recently “17 Revelations On How An Online Retailer Went From Zero to $1.2 Billion“ demonstrating again the “WOW ” factor by taking the time to monitor conversations and real time search about their “Brand” and then comment (obviously enabled through their online real time search monitoring tools). Zappos wants to create an environment that is friendly, warm, and exciting. They encourage diversity in ideas, opinions, and points of view. The best ideas and decisions are made from the bottom up, meaning by those who are on the front lines and closest to the issues and/or the customers. The role of a manager is to remove obstacles and enable his/her direct reports to succeed. The best leaders are servant-leaders. They serve those they lead. Many of the company’s best ideas have been the direct result of informal interactions outside of the office. For example, the Zappos idea for their culture book came about from a casual discussion outside of the office. Note: Zappos culture is very “Social”. They work together and they also play together. The bonds go far beyond the typical “co-worker” relationships found at most other companies. They actually set aside time as part of the companies policy during work hours to “socialize”. They believe in working hard and putting in the extra effort to get things done more efficiently. There is always room for improvement in everything they do, to stay ahead of the competition. Note: Social Media allows them to get their marketing message out more efficiently. The Positive “WOM” (Word of Mouth) delivers on this core value in spades. Zappos values passion, determination, perseverance, and the sense of urgency. They are inspired because they believe in what we are doing and where we are going. Passion and determination are contagious. This inspires others to have the same attitude. Note: Social Media enables that passion to be transmitted and transmuted online and offline in a leveraged way and through different media that did not exist 5 years ago and you can see that impact day in and day out online via blogs, Twitter and blog comments. They believe that no matter what happens they should always be respectful of everyone. In the long run, they believe the companies character will speak for itself. 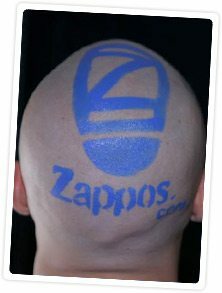 Have you experienced for yourself the “WOW” factor of Zappos?